I was recently invited to share a monthly blog article once a month (or more) with a major Pagan magazine, and while I ultimately decided I just didn't have it in me to do it right, I did make a couple of attempts at writing them. Here, then, is one of those articles for you to enjoy. "This thing all things devours: birds, beasts, trees, flowers; gnaws iron, bites steel; grinds hard stones to meal; slays king, ruins town, and beats high mountain down." If you are, by chance, a “Lord of the Rings” fan, you are probably familiar with this riddle Gollum posed to Bilbo. The answer to this fascinating question is: “A nonspatial continuum in which events occur in apparently irreversible succession from the past, through the present, to the future.” In other words, it is that one thing which so often eludes us in the rush and tumble of everyday life when we are trying so very hard to do all the things we HAVE to do along with some of the things we would LIKE to do! Time. That rotten monkey on our backs always challenging us to do one more thing, take on one more task, go faster, think smarter, multi-multi-task. Oh, and did you check the air in your tires, floss your teeth, and take the plastic bottles and newspapers to the recycling center? How about planning a Sabbat celebration for children while you’re at it? Sure! Why not?! You know why not – because it takes a lot of effort and some of that “nonspatial continuum” which must exist in an alternative universe, because it certainly seems to be missing in THIS one! In order to interrupt your apparently irreversible succession of events as little as possible on their way from the past to the future, I would like to suggest that you go right ahead and enjoy that adult-only immersion into ritual bliss (whether celebrating as a solitary or with friends) and you can still help to teach the future generation of Witches and Pagans (because we DO want more of us in the future in THIS universe – right?) by celebrating the SPIRIT of the Sabbats with activities which are simple, fun, and only take a small bite out of that annoying, slippery continuum which refuses to hold still. Consider honoring the Sabbats by doing “something” wherein you acknowledge “nature” (God and Goddess/ Universe) instead of a full blown, in-Circle ceremony. Yule – honor the longest night by turning off all the lights in the house, then lighting a candle. Take that candle throughout the house to light candles in each room. Celebrate the New Year now. Give each other Yule gifts. Make a blanket fort and see how dark you can make it. Put a dark cloth over your heads and see who can be quiet the longest, or take turns naming things that glow. Imbolc – go out in the yard to clang pots and pans together to awaken the Spirits of Spring! Clap your hands! Sing songs! Bless some seeds while you wait for the time to plant. Talk about seeds and when the best time is to grow them during the year, depending on where you live. Ostara – Time to plant seeds! Celebrate the Spring Equinox by balancing an egg. Go on a nature walk to look for signs of Spring. Each person think of three different kinds of flowers they like, then take a walk through Lowe’s or Home Depot to see if you can find them. Ask a clerk to tell you something about an unfamiliar plant, or find one growing and look up information about it. Beltane – Pick flowers. Give flowers. Make paper flowers. Plant flowers. Color them too! Celebrate love and friendship in whatever way you like. Find out something new about Cupid or Aphrodite. What other Gods and Goddesses of Love are there? Make heart-shaped cookies! Litha – Celebrate the longest day of the year with all kinds of symbols of the sun. Maybe even watch “Tangled” together! The garden (if you have one) is growing beautifully now. Eat some fruit. Buy it if you don’t grow it yourself. Melons. Strawberries. Have a picnic. Splash in the water. Celebrate the great energy of this day by playing together as a family. Lughnasadh – this Sabbat celebrates the first harvest of apples, grapes, grains (breads). Make a “bread man” together and eat it all up. Make it out of cinnamon if you like, or some other sweet bread. Honor the many-skilled God by putting puzzles together, or making a project together – out of paper, wood, play-dough. It doesn’t matter. Paint! Do something to celebrate and/or increase your skills. Play games together of any kind, from a bean bag toss to a board game, or anything at all. Mabon – the Autumn equinox! Time for more balancing. Play Twister! Balance rocks on top of each other. Or wooden blocks. Maybe Legos?! Balance them upside down! It’s also the second harvest! Time to eat! This is the “Witches’ Thanksgiving” – so have a feast! Eat some corn on the cob and have a picnic. And why not? Make a sun and moon symbol out of clay and paint it. Or out of bread and eat it. Samhain - If you celebrate this Sabbat as the Witches’ New Year, then celebrate by blowing horns or by using decorated toilet paper rolls. This is a time to remember our ancestors. Have a “Dumb Supper” where nobody talks and you leave a plate for the ancestors. Tell stories of your own parents or anyone in your families who you know anything about. Remember those who have died, even if you don’t know their names. Lift your glasses in celebration of the lives they lived and in all THEY found joy in, during their lifetimes. This is also the third harvest, when the animals would be slaughtered so the people wouldn’t have to feed them through the long winter months, and so that they people would have something to eat. Celebrate with bacon! Or a BBQ! And so, you see, there are many ways of celebrating the turning of the Wheel of the Year, and the Sabbats, other than just being in Circle and having a “ritual.” And, of course, there are plenty of songs to sing throughout the year, both on our “Friends of Rupert” channel on YouTube and many other places too! And I’m sure you can think of plenty more ways to enjoy every holiday! Celebrate the reasons behind the Sabbats, and teach your children to do the same in ways which won’t leave you “riddled” with how to find the time to do so. Your choices make a difference. You make a difference. Merriest of Meets yet again! We'll be filming and editing our fourth episode, "Celebrating Ostara" in the next few days so watch for that show soon! Producing the Friends of Rupert Show is so very exciting, because we will soon have quite a few Friends who will be joining us with segments of their own. PaganDad Patrick McCleary is already doing our Full Moons each month, and Kiki from Spiral Rhythm has given us permission to use one of her songs in our third episode. Crystal Aveta will be bringing us more segments of the Magick and Mundane properties of Herbs soon too! I am personally thrilled that Nova Era has allowed us to use their song, "Child's Play" during the closing credits. Tonia is currently busy painting new illustrations for our fourth hardcover: "Ruperts' Tales: Rupert's Bedtime Stories," which we hope will be released in 2014. Tonia lives in Ohio and has recently moved to a very rural area where she owns both a home and cottage. She is in the process of creating a haven for all of Rupert's living friends who dwell in the forest all around her and will be opening up the cottage for visits by guests to see her latest work and meet our furry friends in person. 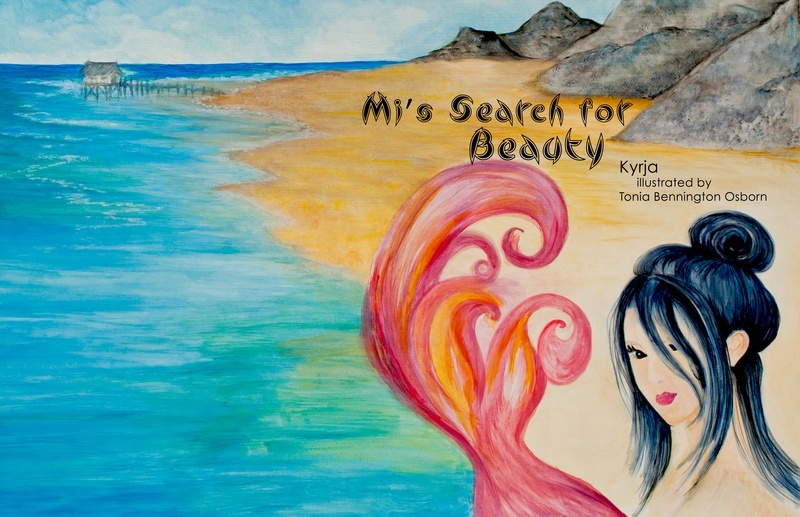 In other news, we will soon be launching a giveaway of "Mi's Search for Beauty" through GoodReads. Speaking of giveaways - remember to get YOUR picture posted on our Friends of Rupert Facebook page for an entry to win our third hardcover,, "Rupert's Tales: Rupert Helps Clean Up" when it is released later this year. Friends of Rupert Show - On The Air! We are so VERY excited to let you know we have launched the Friends of Rupert Show through The Illuminati Network! The “Friends of Rupert Show” focuses on teaching children Pagan traditions and practices through stories, songs, humor, demonstrations, and short films, provided by “Rupert’s Tales’” author Kyrja and many other Friends of Rupert from around the world. Our show will feature segments about the Gods and Goddesses, the magick of science, the magickal and mundane properties of herbs, spell casting, moon cycles, gratitude, tools of the Craft, positive proclamations and so much more. Along the way, we will also share tales and tunes, both old and new, featuring Rupert the rabbit and many of his friends too. So hop on over to join us – Rupert is waiting for you! We have our very first episode up and ready for you to watch. Now we're hard at work creating new episodes too! Check back often to see what's new. Thank you for being a Friend of Rupert! I was recently contacted by Daylina Miller, a reporter with a local newspaper - The Suncoast News - who wanted to do an article on alternative faiths. I was delighted to welcome her to The Glitter Dome for a tour and interview. Because this particular interview does not have an electronic version, I have re-typed it in full to post here. I only regret that I cannot share the wonderful picture she took of me an my Rupert puppet for the article. NEW PORT RICHEY – In a candy-colored house off Washington Street lives a women who goes simply by the name of Kyrja. Her multicolored home, recycled lawn decor and brightly painted garden planters attract the stares of passers-by – perhaps even more than her hot-pink-colored hair does. The series began as a nagging thought in the back of Kyrja’s mind. One day in 2008, the pressure to write the little rabbit’s story overcame her and she left her construction job in the middle of the day to go home, muddy boots and all, and sit down and put pen to paper. Above Kyrja’s couch hangs the first painting of Rupert done by Tonia Bennington Osborn, the artist who illustrates Rupert’s journeys. “No surface is safe when I have a paintbrush in hand,” Kyrja said, laughing. Even in Kyrja’s kitchen, creativity abounds in an island that serves as a makeshift holder for bottles of other paint and art supplies and a dishwasher that holds her spices. Very little negative feedback has come from the pagan community, but those unfamiliar with pagan practices and ritual are another story, Kyrja said. While she declined to comment on specifics, saying she’d rather focus on the positive over the unpleasant incidents, she said she knows that no matter what anyone does, someone will complain about it. “There are always parents that are going to freak out with anything they perceive to be different than what they’re comfortable with,” Kyrja said. To those who don’t embrace pagan beliefs or customs, Kyrja said, she always tells people that “all knowledge is worth having and it doesn’t have to threaten what’s important to you.” Her parents are devout Catholics who raised her in the traditions of the church, have all her books and are very proud of her, Kyrja said. Kyrja’s third book on Rupert, titled “Rupert’s Tales” Rupert Helps Clean Up,” is due to be released sometime this year, although a specific date has not been set, and teaches children about reducing, reusing and recycling. Kyrja is also working on a video series set to air at the end of January that will present more of Rupert’s tales, plus topics like the science of magic, mundane and magical uses of herbs, moon phases, tools of the craft and more. The video podcasts, which will be recorded mostly by Kyrja in her home studio, are set to stream through the Illuminati Network website, an organization dedicated to providing information from an occult perspective to promote diversity and understanding. In addition to writing about Rupert, and soon, broadcasting his adventures, Kyrja performs his adventures via storytelling and songs at local pagan festivals. She performed at 22 events in 2011 and 27 in 2012. her fluorescent hair, infectious laugh and tendency to burst into song at any given moment draw the attention of children and adults alike. Kyrja keeps the door open for visitors and encourages neighbors to stop in for a tour of the inside when she’s not busy standing on a ladder to paint a ceiling mural, or writing about Rupert’s next great adventure. If I didn't know better, I would have to say that I really enjoy doing interviews. Actually ... I do NOT know any better, and I DO love doing interviews! The reason is that I get to talk about Rupert's Tales and many of the things that go on behind the scenes. And I also get to "meet" some very interesting people who seem to like what it is I do (which is always a wonderful feeling), AND I usually get to spend some time talking with one of my favorite people in the world, Rupert's illustrator, Tonia Bennington Osborn. She always - ALWAYS - says something during our interviews together which I never knew before, and today was no exception. She has recently moved to a very wooded area in Ohio, on ten acres. She has both a house and a cottage on her property and is going to use the cottage as her new studio/gallery. Plus, since most of the animals which can be found in Rupert's Tales live all around her, she is soon going to start inviting people to visit her so she can introduce them to the living version of our all of our furry friends - including a living Rupert! To find out more, hop on over to Pagan Homeschooling Network to listen to our interview. Thanks for being a Friend of Rupert! Although I have consistently done my best not to tie myself to doing a blog ~ here I am! I probably will NOT create so very many entries, as I would truly rather be writing a story or song, or perhaps painting ... but I suspect I shall write one now and then to share what's new and what's coming next. Currently, we are very, very excited because we know our third hardcover, "Rupert's Tales: Rupert Helps Clean Up" will (finally!) be coming out in 2013. We are depending heavily on all Friends of Rupert to help us get out word, as our publisher has agreed to put our additional titles in an accelerated schedule if this book does well. However, should we fail to sell enough copies, I'm afraid this will be our last title with Schiffer - and that would be very sad indeed. If we do well, though, then we will see "Rupert's Tales: The Wheel of the Year Board Game" as well as a Huggable Rupert! Wouldn't that be simply wonderful? I'm sorry to report "The Monster Got Mom" is currently on hold while we continue to search for a publsher. This is an extremely challenging project, as most traditional publishers are not currently accepting manuscripts of this nature. We hope to bring you good news about this fun adventure soon. "Shattered Prophecy" is the first title in a three-book fantasy-genre series which is a huge departure from Rupert's Tales and is for an adult audience. Most of my writing effort throughout the years has been spent immersed in writing these kinds of epic adventures; Rupert was truly a great surprise to me. I remain hopeful I will have this series published before much longer as well. As you may have heard by now, we are currently in contract negotiations with the Illuminati Network to bring you the "Friends of Rupert" television show. We expect to launch near the end of January, 2013. You may believe we have been working very hard to bring you programming which is both educational as well as entertaining. More information will be forthcoming as it is available. That's all the news that IS news at Kyrja's Kreative Korner - for the moment!